To say this past weekend was “eventful” wouldn’t do it justice! I had the opportunity to Dive With The Sharks at one of the best Tampa Florida attractions, the Florida Aquarium, located right here in downtown Tampa’s Channelside Bay Plaza. As far as Tampa Bay entertainment goes, this tops the list. With a total of 14 sharks, two really big amberjack, a huge sea turtle and a massive Goliath Group named Gil (who took a very serious liking to me during the dive), this is an experience I will never forget. The program is approximately 90 minutes including an educational presentation about sharks and a 30-minute dive in the Shark Bay exhibit, which is a 93,000-gallon saltwater exhibit home to shark species and sea turtles from around the world! And to add to the excitement, I became an instant celebrity! Little did I know going in to this that any visitor to the Aquarium could see me during all phases of the dive from the Ocean Commotion gallery on the inside of the Aquarium. Needless to say, I had a great time waving to everyone as the sharks swam right by my head! And for those of you who are like me and are wondering, “is this really safe,” I can tell you that I felt completely safe and prepared throughout the entire experience. 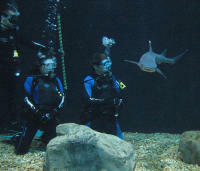 Each guest is paired with a Florida Aquarium dive master whose sole responsibility is the guest’s safety. There are two dive masters in the exhibit with you and one surface tender present during all dives. So, if you are a certified SCUBA diver who is at least 15 years old, this is something you absolutely HAVE to do! Trust me…you’ll never do anything else like it! Keep checking back here for more fun and exciting things to do in Tampa Bay, as well as Tampa Bay area events. And, let me know if you are able to make it out and swim with the sharks at the Florida Aquarium…or if you just have any questions about my experience.